Place all the ingredients into a slow cooker and make sure that there is enough water to cover the bones. Set the slow cooker to cook for 8-24 hours. Strain the liquid from the slow cooker with a fine mesh sieve. 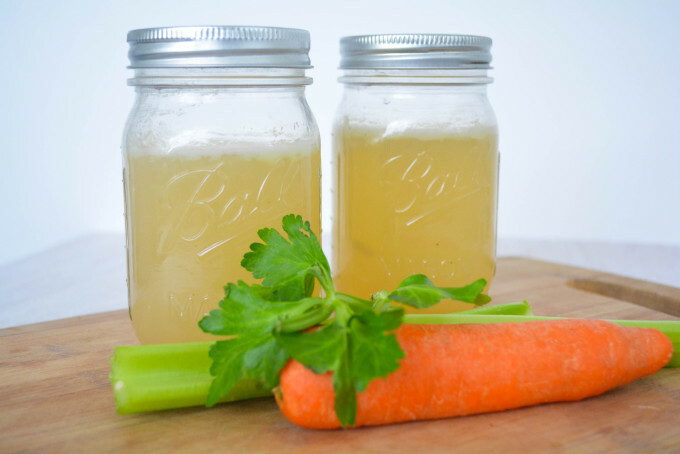 Store the broth in glass jars. It will keep fresh in the fridge for 3-4 days. Extra broth can be kept in the freezer. Notes - you can use any type of bones that you prefer. Chicken bones make a lighter stock and takes less time to cook due to the small bones. You can add any type of vegetables or herbs to flavour the stock that you have left over in the fridge.